Ever wonder how to make level, wobble-free cabinet shelves? The Milescraft CabinetMate™ is just the tool to get the job done. This easy to use, lightweight and durable jig is a great alternative to shop made jigs, which typically wear out after just a few uses. 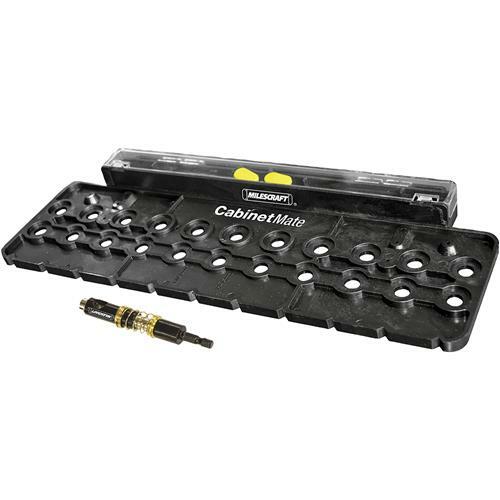 The CabinetMate has a rigid main body, indexing pins and a self-centering, spring-loaded drill bit. The custom spring-loaded brad point drill bit allows the holes you drill to self-center with the holes on the main body. This bit is pre-set to bore a crisp hole with consistent depth for a perfect fitting shelf pin. The Cabinetmate also comes with a built in closed storage compartment for your bit and indexing pins. The CabinetMate allows you to accurately drill eleven holes, evenly spaced at 32mm apart, in just one setting. This innovative tool can be used on cabinet sides before assembly, already assembled cabinets and face-frame or frameless cabinets. A stand-out feature of the CabinetMate is that it also allows you to mark the locations for euro-style hinges. This tool comes with the 1/4" self-centering drill bit. If you are looking for a very affordable, high quality and extremely versatile cabinet jig, the new Milescraft CabinetMate is the only one you will need to look at. I had only one occasion to use the Cabinetmate and although it worked well, not enough experience to recommend it.